A few months ago, we discussed how the design of Sellbrite's free-trial sign-up modal pulled users into the page, encouraging them to complete the longish sign-up form. Keeping the same engaging background, the team has recently updated the design of the modal itself, making it even more user friendly and earning themselves some extra UX points. 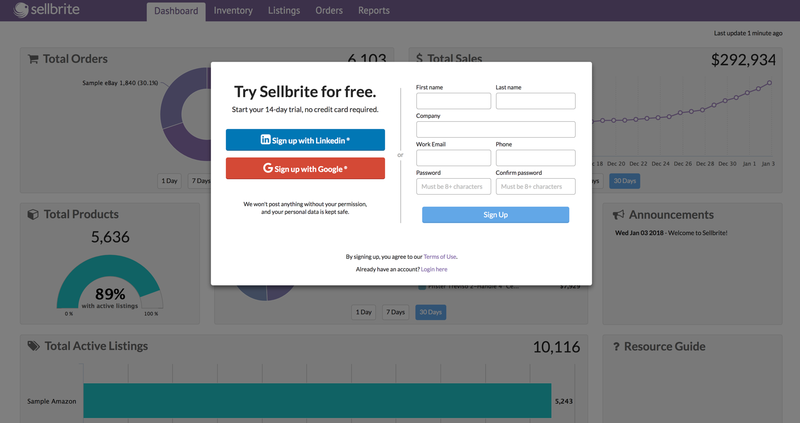 In redesigning their sign-up modal, the Sellbrite team has kept what worked best: a full-account sneak preview in the background that encourages users to complete the sign-up so they can dive into their own charts and data. The more compact design of the sign-up box takes up just half the length of its predecessor on the screen. This makes it seem far less daunting to a new user, despite including the same number of fields to fill in. In addition, the left half of the modal now gives users social sign-up options through LinkedIn and Google. This makes sign-up a much faster process, resulting in a much smoother user experience.